Become your own hero with the first ever official licensed Formula 1 racing simulators! For the real Formula 1 fans, Playseat® has official licensed F1 racing simulators! These chairs exactly reproduce the driving position of an F1 racing car and let you experience the thrill of Formula 1 racing. 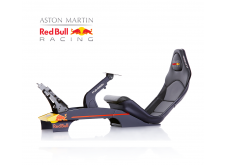 Among Playseat® F1 racing seat users are professional drivers like youngest Formula 1 driver and Grand Prix winner ever Max Verstappen, F1 champion Sebastian Vettel, Sébastien Buemi, Mark Webber, Carmen Jorda and many others! They confirm that Playseat® F1 simulators faithfully reproduce the position and the feeling of driving a real Formula 1 car! Feel the emotion of driving a true single seater at home with Playseat® F1 racing seats! Thanks to many adjustment possibilities, every driver will be able to find the best suitable driving position. An appealing design and high quality materials will make sure you have a wonderful simulated driving experience. The Playseat® F1 models are very stable and comfortable. Thanks to the high quality leather-look black vinyl seat, the Playseat® F1 chairs look and feel great. All Playseat® racing chairs are compatible with all wheels and pedals on the market.